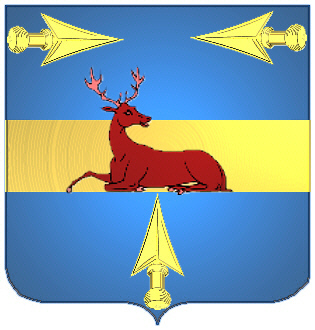 Coat of Arms: A blue shield with a red buck lying down, on a gold fess between three gold arrow heads. Motto Translated: Wisely if sincerely. Motto: Sapienter si sincere - "Wisely if sincerely". "Unlike many Highland clan names which begin with the Gaelic 'mac' meaning 'son of', the son o f David took the non-Gaelic form and became Davidson. There are a number of different Davidson lines but the most significant was from Badenoch. 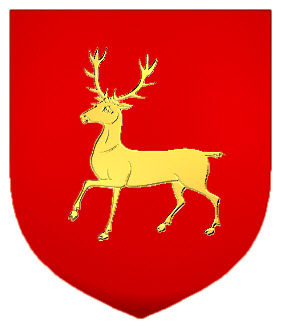 They may have been a branch of the Comyns (Cummings) who were defeated by Robert the Bruce and became known as Clan Dhai when the Comyn name was prescribed around 1320. 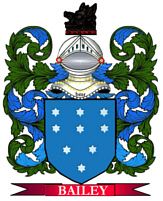 They became attached to the Clan Chattan confederation and David Dubh of Invernahaven, the first known bearer of the Highland line of Davidsons, married a daughter of the 6th chief of the Mackintosh clan. "The Davidsons became quite powerful but they became involved in various feuds, particularly with the MacPhersons (another part of Clan Chattan), following a dispute in 1370 over who should lead the right wing in a battle between the Clan Chattan and the Camerons. The MacPhersons withdrew and the Davidsons suffered heavy casualties. The Davidsons are said to have formed a part of the Clan Chattan force which fought in the famous "Battle of the Clans" at Perth in 1396. This was staged in front of King Robert III. As a result of these two battles, the Davidsons lost many men and declined in power and became scattered. The chieftainship of the clan was held by a Davidson from Tulloch for many years, possibly after the chief moved north after the Battle of the Clans. There were Davidsons in Tulloch, Ross-shire through to the early part of the 20th century. Tulloch Castle was the seat of the Davidson chief for many years. There were Davidsons of Cantray, Inverness and Davidsons of Inchmarlo, Deeside. The Davidsons in Aberdeen can be traced back to the late 14th century when Robert Davidson was Provost of the city - he was killed at the Battle of Harlaw in 1411.
the North" and in the reign of Charles II, the Scots Commercial Representative at Veere in Holland was Sir William Davidson from Dundee. The Davidson clan motto is "Sapienter si sincere" which means "Wisely if sincerely". 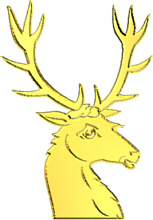 Surnames regarded as septs (sub-branch) of the Davidson clan include Davie, Davis, Davison, Dawson, Day, Dean, Dow, Kay, McDade, McDaid, MacDavid.